Description: This project is to develop and explore the militias of the Frontier. The Royal Marines are well covered in their own project and any development of them should be covered there, which seems right since they played such a major role in the published modules. All the other militia organizations can be covered here. Description: This project is meant to relelease new errta on rules (instead of filling up the Frontiersman with them). The mini guides will also explore new tech, skills, and much more that many gamers might not feel will work, but it will give GMs from other games an easier way to make more for their players. Description: The purpose of this project is to be a collaborative effort to create a usable adventure or set of adventures to take place in the New Streel system. This may include a set of Knight Hawks and role playing adventures in space plus adventure ideas/scenarios for a planetside module on Corpco. The intention is to then submit the collaborative adventure(s) to either Frontier Explorer, if is just a short scenario, or Star Frontiersman magazine (if it becomes a whole campaign worth of ideas). Although I will be presenting adventure concepts and ideas that are from my "Joe's Half-Baked Ideas" project here, everything is open to change. That means if you find an idea unplayable, confusing, etc. it will be scrapped. If you have a better idea, or a more interesing scenario that can take place in the New Streel system, please present it. Description: Everyone needs a quick NPC Party once in a while. Feel free to browse the files here and/or add your own for other GMs to utilize. Submitted parties can be as detailed as you wish to make them. Description: This project is for the collection of data on everything from the escape velocity of Gran Quivera to the temperature of the north pole on snobol. From how fast 1g acceleration is to the air pressure at sea level on Inner Reach. This is for everyone's research and edification. This project was made mostly for providing facts that get used more than most, such as velocities. So that people don't have to look all over the galaxy for the information they need. 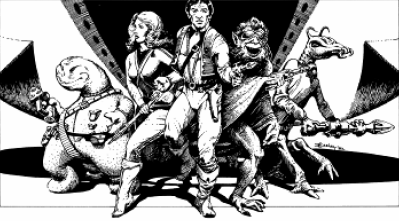 Description: A Project to produce a set of rules under the OGL usable for playing in the Star Frontiers setting.